Welcome to Garden Bloggers’ Bloom Day at May Dreams Gardens! Though the first half of February has teased us with some sunny, mild, nearly spring like days, it is still winter here, so the floral action is almost all inside in my USDA Zone 5 garden. One of the stars right now is my row up of hyacinths ‘on vase’, just starting to bloom. Because of their strong floral scent, you notice them as soon as you enter the house. Unlike those soldierly rows of hyacinths we often see bedded out in the garden, these hyacinths all seem to be doing their own thing, both in height and in bloom time. I think I’ll have hyacinths blooming for quite some time. 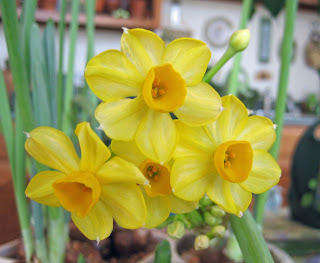 In the sunroom Narcissus ‘Grand Soleil d’Or’ has started to bloom. I was encouraged by Elizabeth at Gardening While Intoxicated to purchase these bulbs from Brent & Becky’s Bulbs. They take a little longer to bloom than the paper whites sold in stores around the holidays but are well worth the wait. They also have a subtle scent, in sharp contrast to that overpowering, “what is that smell” scent of other paper whites. It’s nice to go in there and enjoy the plants. If you squint just right while sitting at the table, you can almost imagine being outside in a warm garden. Elsewhere inside, the Amaryllis, Hippeastrum ‘Blossom Peacock’ (pictured) sent up a second bloom stalk, as did Hippeastrum ‘Green Goddess’ (not pictured). I also bought these bulbs from Brent & Becky’s Bulbs after reading about some of the Amaryllis that Cindy at My Corner of Katy had purchased. The third Amaryllis that I purchased at a big box store had just one bloom stalk topped with a quartet of muddy red blooms. While I know it is easy to pick up amaryllis bulbs at the big box stores, and I often do, I encourage those interested in something different to check out specialty bulb growers. Outside, a lone snowdrop (Galanthus sp.) presented itself on Thursday and is still blooming valiantly, even though it is alone and it is cold out there. I hope, I know, it will soon be joined by Crocuses, Irises, Daffodils, and more Snowdrops. And I’ll be outside with it more in the coming weeks, too, as winter loses its icy grip and spring takes hold in my garden, a place I like to call May Dreams Gardens. This February starts the third year of Garden Bloggers’ Bloom Day, a tradition of posting on our blogs about what’s blooming in our gardens on the 15th of each month. For those who have kept up with this tradition from the beginning, you now have two years of bloom day posts to go back to and compare your blooms from one year to the next. All are welcome to post for bloom day, whether this is your first time or your 25th time, whether you have a garden blog or some other kind of blog. It’s easy to join in. Just post on your own blog about what's blooming in your garden right now, outdoors or indoors. You can include pictures, lists, common names, botanical names, whatever you’d like to do to showcase your blooms. Then leave a comment and put your name and a link back to your bloom day post in the Mr. Linky widget, so we know where to find your blog and can visit to see and read about your bloom day blooms. It's nice to have some blooms and greenery inside at this time of year. Your Hyacinths must smell heavenly when you walk in the room. Happy 3rd Anniversary of GBBD Carol! Oh, this is the third? I thought it was the second. Happy anniversary! Carol, That amaryllis is beautiful! I never remember to do some hyacinths inside, but that would be a wonderful dose of spring. I finally found something to post this month. Congratulations on year three! I know I do look back to see what I had in the same month, prior year. Thanks for getting & keeping it going! Happy 3rd anniversary Carol. I can see you are forcing pretty many bulbs! This month again everything is covered with snow outside, but indoor blooms cheer me up a lot. My Hardy geranium brought home for winter is in bloom again. To see my post, click my name above. Carol, thanks for inspiring us and bringing us all together for GBBD. This is the first time in the three years I've managed to take pictures and get it all together in time to hit the 15th. Looking forward to seeing everyone in Chicago! Hi Carol, I have posted about some of our indoor plants since we find ourselves traveling this week. I know we have Snowdrops and Winter Aconite outside but there may even be more given the lovely weather of the last week in Maryland. That's a lovely Amaryllis by the way! Never seen such a sweetly coloured double one. My FEBRUARY SNOWBALLS are HERE. This is my first Garden Bloggers' Bloom post :) Many congratulations on your third anniversary Carol ! Spring is oh so slowly creeping in here so finding plants in bloom was a challenge. Your hyacinths in their different coloured vases make an eye catching display, and their scent must be wonderful. We've had major snow and frosts the past week, but today's Blooms Day shows just how tough our late winter flowers can be. Thanks so much for sharing your beautiful bulb collection, Carol. I can only imagine how wonderful the fragrance must be! I don't have a whole lot to share at Hayfield this month, but I couldn't miss Bloom Day, so my link is above. I have been posting a 'bloom-list' at the beginning of every month since octobre 2007, and after having learned about Garden Bloggers Bloom day, I changed it to the 15th (since last month). May I join in wishing you a happy bloomdayaversary? Your hyacinths are an independent lot, I love it! Vive la difference! Seeing what was posted in previous years makes this a good system for keeping track of progress, a wonderful way to enjoy so many blooms from around the world. Thanks, Carol. Thank you for three years of trying to keep us all somewhat organized. That amaryllis is to die for Carol. It is so pretty it looks artificial. Ha... I just love the oxalis too. It looks so delicate. Happy GBBD. You have a lot of blooms going on inside, very pretty. Thanks for brightening up this cold sunday morning! I appreciate and so enjoy reading your blog and seeing all those wonderful pictures. Congratulations on your third anniversary of GBBD! I realized I just completed a year's worth of Bloom Day posts, and I want to thank you for hosting this every month. It's such an enjoyable meme, seeing everyone's blooms each month, not to mention a great way to keep a record of what is blooming when. I bet your sun room is the favorite and most cheerful spot in your home right now; with the wonderful scent of hyacinths on the air. I'm looking forward to seeing your other spring bloomers. As this is only my second or third posting on bloom day I don't have anything to look back on but it will be great to look back next year. Happy 3d Bloom Day anniversary! Your first photo of the Hyacinth is so beautiful, I can almost smell it. Just as Elizabeth inspired you to order bulbs, seeing your Oxalis has inspired me to order it. I also have a burgeoning case of Hyacinth vase envy. 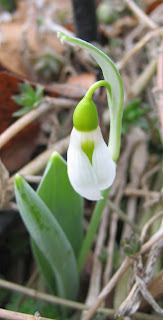 Your advance scout Snowdrop will soon be joined by the rest of the troops and the Crocus cavalry can't be far behind. I too am jealous of the beautiful amaryllis blooms. I can't see any buds on mine yet. They were started after vacation in January. It's hard to be patient when you see the beautiful blooms on yours! Hi Carol, happy GBBD. Love those colours! The yellow of the narcissus seems to declare..Look at me! The amaryllis is gorgeous! Thank you for doing this! I look forward to it each month. It also organizes me to see what is blooming each month. Next year it will really reveal itself when I can compare the same day from year to year. I love your post. Makes me want to do more indoors. Carol, I'm with MMD and love those bulb vases. Are any of them antique? No blooms here this month so I am enjoying seeing all of the ones on your list. Thank you as always for hosting this meme and hooray for 3 years of it! You've inspired me to try indoor hyacinths and amaryllis next year! Your indoor garden is simply lovely. I'm glad to see the Snowdrop. That first outdoor bloom is a welcome sight after a long cold winter. And yours are colder than mine! Saw Anna's post this morning and felt totally motivated to get out there for myself and find out just what is in bloom right now. And stop concentrating on those that are yet to do so. It's sowing all those seeds that does it. It's been a while in upstate NY since there was anything to post on bloom day, so I'm happy to be here today. Thank you for hosting the happy event and for sharing the beauty of your sun room--we are all vicariously soaking up the sun and scent with you. Gorgeous bulbs, Carol. Congrats on three years of GBBD. I haven't missed a day since I've joined. My February post is up. Oh wow! I sure looks like spring inside your house. Soon it will be outside too. I wish my cats weren't plant murderers. I'll have those frow lights intalled in my craft room soon and I'll be ready to start some seeds. My rather lame post is up. Your flowers are much nicer to look at than my animal footprints in the snow. When is spring? I'm adding my congratulations to all the others as well as my thanks for helping me create a wonderful record of blooms in my garden. I so appreciate your vision in helping it happen. I've got a few blooms out in the rain and since we're having rain I have hopes of more to come! Happy GBBD anniversary, Carol! 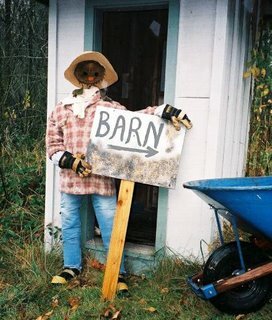 I just started blogging in October, and discovered you almost right away as I was searching for other garden blogs to look at. I love all your blooms, but I think that lonely outdoor snow drop is my favorite. I hope the ones I planted in the fall didn't get eaten by the squirrels that were watching me plant them. Carol I envy your row of Hyacinth. I planted up several pots of hyacinth for forcing and left them outside , which always works here. Accept this year when the combination of extreme wet and extreme cold turned them to mush. I may have to run out and buy some. I don't know why I never buy flowering house plants, though I do have one aloe that blooms 3 times a year. Thanks for hosting all us flower-a-holics. You have some beautiful bulb vases Carol ~ makes me want to add to mine. Congrats on three years of hosting GBBD! 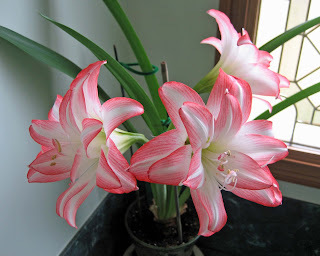 That is such a lovely Amaryllis, but my favorite is the snowdrop - a real bloom from outside. Lovely! I actually remembered to participate in this bloom day, so it's my first. Not a lot to offer, but what can ya do? :) Thanks! You have so many blooms inside. I love the amaryllis. I think this is such a fun idea, and I'm on my second month. I started looking a few days ago for what I thought might be in bloom for today and see even more that should be ready for next month's bloom day! Carol, what wonderful indoor flowers! Your hyacinths are beautiful, but the amaryllis are perfection! Amaryllis next year for me, for sure! Thanks for BloomsDay! Such a wonderful idea, and so helpful to me because it reminds me to make a record of what's out NOW! Zone 7 is really cooking now! It's wonderful to see all of the flowers in bloom. Congrats on 3 years of GBBD. I just wish I'd discovered it earlier! Lovely bulbs! Mine aren't quite there yet. Your amaryllis is stunning! This is the second time in two days I've seen really nice amaryllis - must be some kind of omen - I need to get some. Blossom Peacock is irresistible! Your garden room is like a dream of a perfect spring, all color and fragrance with no hail, high winds or late freezes! There's not much floral action in my Austin garden but there's a post at Annie's Addendum. That double-Amaryllis is just breath-taking! Thanks for the link love, Carol! My Amaryllis are all bloomed out but there's lots going on outside! Mmmmm...I bet your hyacinths smell divine! Congratulations on the GBBD anniversary, and thanks for hosting! Love your profusion of blooms indoors and your brave little galanthus out! Thanks for hosting this and congrats on three years of sponsoring this great community thing! Carol, thanks again for hosting this- it's so much fun! I love to see what is blooming in others' gardens! Looks like you have a lovely display going on there. I really wish I would have started something in the house this year! This is a great idea and obviously has taken root! I'm a late bloomer and happy to jump on board (to mix metaphors). 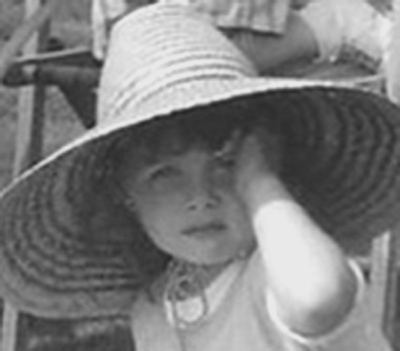 It'll be really nice to be able to look back at years past, in years to come! Happy anniversary, this is a very nice tradition and I'm going to treasure the fact that I've contributed for a very long time. It is indeed a great way to keep track of what's going on in the garden. Just discovered Bloom Day! First time posting on my occasional garden blog. What a fine array of blossoms in your house this February Carol. I bet the fresh spring scent is quite lovely too. Congratulations on your 2 year run! Great work. Someday, when I have better windows, I will force bulbs inside too. 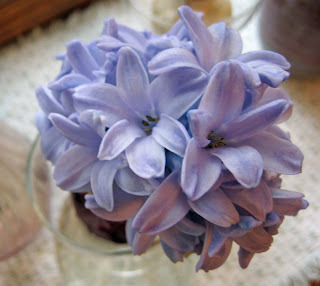 I love the way hyacinth smell. Thanks for hosting GBBD. Now I am off to look at all the other flowers. 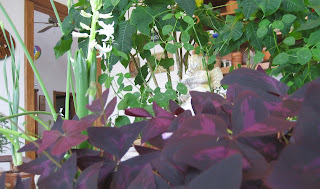 We both have purple oxalis, Carol, though mine is growing outside. You have a lot of beauty indoors---good for you! Happy Bloom Day! I'm glad you posted your progress on the bulb forcing. I may have to try it next year, if I can keep my cats away from them! Wow! I've got a lot to learn. Have only had my blog three days and made my first bloom day post this afternoon. What I wouldn't give to have even one lone snowdrop bloom like yours, Carol. Off to take a look at all the other beautiful blooms. Well, I have my post up. Sorry to be so late getting a post up and my comment made. As you will see when you visit The Havens, we have been quite busy today. Now I have had a chance to actually read through your post, and admire your picture. I am so jealous! You have a sun room! The row of hyacinths being forced is so neat. And that amaryllis is just gorgeous! I have a burgundy oxalis very like the one in your picture, I love it because it performs so beautifully all year on the light shelves in the dining room. Thanks for hosting Garden Bloggers Bloom Day, Carol. I love having the chance to visit all the other gardeners. It truly is a blessing that there is a place we can reliably come and find each other's posts! Haven't learned the bulb world yet but am inspired by yours, Carol. Thnaks! My GBBD post is up. Thanks again for hosting. Carol, I absolutely LOVE your row of hyacinths. Adorable. I'll bet the fragance is intoxicating. Thanks for hosting this for so long as well! I'm new to blogging and am looking forward to being part of this great group! I have finally posted my GBBD. The rain we have had delayed my picture taking. I can't wait to see what other have posted. I can't believe this is already the third anniversary. 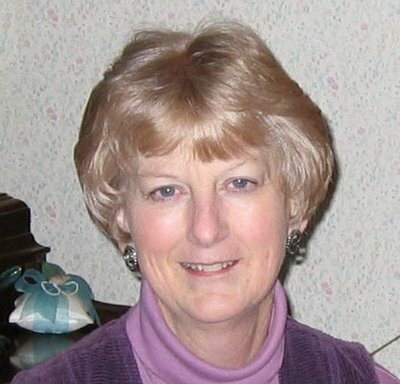 Carol, sorry, but #79 was mistyped on the Mr. Linky widget, so I had to type it in again. You should probably delete it. Though I liked all your flowers this month, especially the amarylis,it was the oxalis that really caught my eye. What a beautiful shade of purple. Don't have a blog but do have Lenten roses blooming and daffodils budding in western NC. Also daffodils and crocus blooming at a friend's house. Indoors: paperwhites, hyacinth, geranium, and begonia. I love all those hyacinths. I've never ever grown them before but my mother did in the first house my parents owned...the year my dad was in Viet Nam. Somehow I've never thought to grow them myself but after seeing yours I feel I need to give them a try. I have been growing more indoor amaryllis. I bought three this year and I think the last one will open tomorrow--not in time for GBBD. Here's to your lone snowdrop. Surely it's a sign that your spring is almost here. Wow - Carol. That Amaryllis is just amazing. 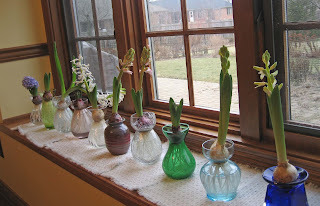 And I love the little row of Hyacinths along the window. I can imagine you sitting there with a cup of tea on a cold morning, wishing for Spring. Maybe one day when I have a house and a sunny window of my own I will have indoor bulbs as nice as yours Carol. In the meantime I will have to make do with my borrowed giant patch of Snowdrops. You just have the one? Oh, I love that Amaryllis. It's perfectly beautiful. My snowdrops aren't up in Bloomington, but the witchhazel came through just in the nick of time for Bloom Day! Lucky you to have so many lovely hyacinths. I don't have any this year, sad to say. I adore the 'Grand soleil d'Or'. They'll go on my wish list! Your Amaryllis is glorious! They're such a treat in winter. I LOVE that snowdrop. So fragile and so captivating. You have the most beautiful indoor garden of blooms I think I've ever seen! Isn't 'Blossom Peacock' one of the best? Mine just finished blooming here. It once bloomed in my garden during the summer while planted in the ground! My Bloom Day post is up. I just got home from Florida tonight, so it's a short one, and different than any previous Bloom Day post I've done. I love your arrangement of bulbs in front of the window, Carol! Also like the new Mr. Linky format. Makes it easier to look at everyone's garden. Thank you, and Happy Anniversary! Uh oh! I really like having a gardener's location as part of their name, so I decided to add that to my profile. I was hoping the name would change on my link, but instead, I added a second link. Sorry!! Doh! I forgot blooms in the house! That's a lot of Hyacinths you have... I have some bulbs in the ground that I planted about 3 years ago. They keep trying to come back each spring but they barely make it. They are putting up leaves right now but the blooms will be weak and limp. I will dig them up this year and store them to see if I can revive them next year in a vase. I guess it never hurts to try. I just potted some hyacinths (my first time!) I hope my do as well as yours. For GBBD I was in Oregon, so I hope roadtrip blooms count. Congratulations and thank you Carol, for starting the third year of Bloom Day. What a wonderful way to bring the garden blogging community together. Your February blooms are just gorgeous. Thank you for inspiring us to enjoy blooms twelve months of the year. I'd never have thunk it in frigid Chicago winters, but it can be done. Life's just that much nicer with something blooming all the time! This is my first time to join Garden Bloggers'Bloom Day. I have a large indoor plant collection and I have half an acre on which I garden outdoors in the suburbs of Chicago. I'm at the library, my home 'puter is kaput, but love your blooms.. esp that double amaryllis! I got mine up, a little late as usual, at Lifw on Tiger Mountain Now I have to dash out to watch the giant orange weedwhacker clear me some woodland gardening space! Carol - sorry I am late to the party to celebrate the start of your third year of GBBD - well done. This month flew past and I completely forgot it was the 15th until last night. I've learned my lesson. Next year there will be hyacinths and Grand Soleil at the very least at my house. Carol, I'm late getting to see all your beautiful Blooms, and those of the other commenters, but I did get my own pitiful post up on time. I am going to have to take myself in hand before next winter. Bloom Day has been a wonderful way to encourage those of us who might not be such wonderful indoor gardeners. I've been posting (mostly) for a year now and it is a wonderful record. Carol, Each year I tell myself I'll finally force some bulbs... Maybe this winter I'll finally do it! Thanks for hosting bloom day! All, thank you to everyone for participating in bloom day again! I think I've visited every blog... I saw lots of blooms outside in gardens to the south of me, and I saw many gardeners like me who have blooms inside and are wistfully looking outside for signs of spring. If I didn't comment on your post, let me know, I tried to get to all of them listed on Mr. Linky. March ought to be good! Ooh, I love all of those wonderful Northern bulbs. Thanks for sharing! Carol, thank you for making me feel welcome on my first GBBD. 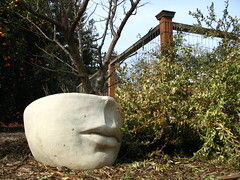 May Dreams Gardens has made our long, cold winter feel a little warmer and more colorful. Better late than never, right? I grew my first ever amaryllis this month! Carol, thank you for a wonderful idea that helps build a really nice sense of nation-wide community. I really enjoy seeing what you and other gardeners are doing throughout the year. -cheers! I love your bulb vases in your window - they're a beautiful collection!